with cannons, anchors and bronze medals embedded in the coral at Stoney Bay, is the island’s most impressive underwater treasure. Off this tiny island at the west end of Anguilla are three mini-walls with ledges and small caves. This site features hard coral, southern stingrays, spotted moray eels, spiny lobsters, turtles and eagle rays. It is good for both novice and experienced divers. Depth: 15-60 feet. Features a variety of coral including black corals and small fish and is recommended for experienced divers. Depth: 110 feet and deeper. This site boasts both soft and hard coral and lots of marine life such as trumpet fish, angelfish and arrow crabs. Depth: 15-75 feet. This location features two sites – West Cay and Devil’s Wall. 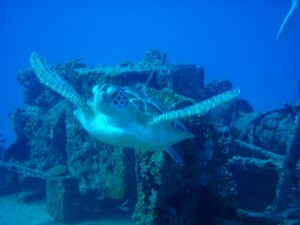 A drift dive along a spectacular rock face with a diversity of marine life. For experienced divers. Depth: 90 feet. A calm and sheltered site ideal for night dives. Depth: 15-30 feet. Ledges and caverns that are home to nurse sharks. Depth: 30-70 feet. This site is noted for its abundance of soft coral and sea fans. Depth: 15-60 feet. Abundant fish and occasionally lobsters; lots of coral and sea fans. Depth: 15-60 feet. Anguilla’s first underwater heritage site, this location is a natural wreck of the late 18th century Spanish Crown vessel, El Buen Consejo. Public dive tours of the site are available. 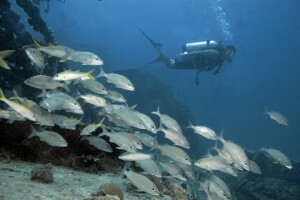 A ledge dive with lots of fish such as angelfish, blue tang, nurse shark, trumpet fish and barracuda. This site provides a fabulous opportunity for photography. Depth: 40-80 feet. One of 9 wrecks sunk intentionally to create an artificial reef, this vessel sits upright on a gentle slope. Abundant fish life can be seen here. Swim through the ship if the current is not too strong. Great for underwater photography. Depth: 40-80 feet. Encrusted with hard and soft corals. Novice to experienced. Depth: 60 feet. Near an excellent coral reef dive. Stingrays, turtles, lobsters, moray eels, barracuda, bar jacks and yellow snappers are common in this location. Depth: 80 feet. Barracuda, south western stingray, yellowtail snapper, angelfish and trunkfish which frequent this spot to create a great photograph opportunity. Depth: 80 feet.